After a homeowner has chosen to replace the windows and doors in their home, we often hear the same comment: “We love our home upgrades… why did we wait so long?” If you are thinking about replacement windows and doors in Kirkland, WA, then it is important that you consider all of the options to choose the right timing for these home upgrades. Here at Signature Window & Door Replacement, we are focused on the satisfaction of our customers. We have worked hard to develop a strong reputation in Kirkland, WA and the nearby cities, and our goal is to help every customer see why we have such a great reputation. When you contact our company, you will receive the undivided attention and the high quality service that you deserve. Do You Need Home Upgrades? Some homeowners wonder if it is the right time to upgrade their home. Since these upgrades will cost money, it is common for people to hesitate and wonder if they should wait for a little while. Instead of worrying about the money and time that it will take to upgrade your home, it is better to focus on the many benefits that you will be able to enjoy from these upgrades. 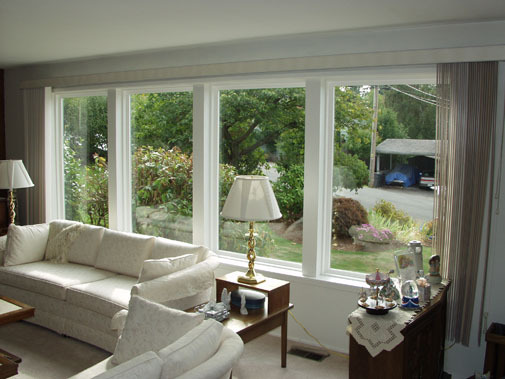 It is actually easy to choose vinyl replacement windows for your Kirkland, WA home. Here at Signature Window & Door Replacement we want to make the process as stress-free as possible. We will talk with you about your goals for the project, make recommendations about the products that will be best, and then we will handle all of the installation details. You don’t need to worry about a thing! Once the vinyl replacement windows and doors are installed in your Kirkland, WA home, you will wonder why you waited so long. These new windows can make a big difference to improve the overall appearance of the property, both inside and out. Additionally, you will see that there are a number of other benefits, such as improved energy efficiency and lower utility bills. Choosing the right contractor is the foundational decision that needs to be made for your replacement windows, because the quality of contractor will have a direct impact on the overall quality of the project. When you are working with an honest team, such as Signature Window & Door Replacement, then you will have the peace of mind to know that you are getting high quality products and a good value for the money that is spent. The right contractor will dedicate time to talk with you about your goals for the project, in order to identify the best products to meet your needs. Since vinyl replacement windows can be customized to fit any space, we can work together to create the perfect new windows for your home. You can choose all of the details, such as colors, size, and features that you would like to enjoy. Choosing vinyl replacement windows for your Kirkland, WA home is a great decision, and you will enjoy these benefits on a short-term and long-term basis. Immediate benefits include an upgraded appearance for your home and improved style. Additionally, you will see that the new windows make a difference to increase the natural sunlight that comes in through the windows, making your living space brighter and more cheerful. In the long-term, you will love the energy efficiency benefits, because you can save money on your monthly utility bills. These savings can add up over time, helping you to recover the costs of the initial investment. Another long-term benefit of vinyl replacement windows and doors is that your property value will improve. These types of upgrades can help you to maximize the price that you will get for your home in the future, in order to increase the equity that you can roll into your next home purchase. Here at Signature Window & Door Replacement, we would like to help you improve the quality of the windows in your home. We have found that one of the best ways to get started with the project is to visit your home and see the space that we are working with. During this complimentary consultation, we will be able to discuss your goals and determine the pathway forward to create the right types of windows that you will love. Are you ready to learn more about vinyl replacement windows and doors in Kirkland, WA? Our team at Signature Window & Door Replacement is here to help! We invite you to contact us right away, and we will talk with you about the options for the project. You are welcome to visit our showroom and see the options that are available, we are located at 1604 15th St SW #110, Auburn, WA 98001. You can also contact us via phone (253) 887-7792 or email us at: marketing@signaturewindow.com.